Blackberry 8800 disassembled | BlackBerry Blast! In case you are wondering what the inside of your Blackberry 8800 looks like but are too afraid to take it apart, a user at BlackberryForums has done the job for you. 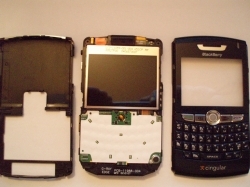 Check the link below for nine photos of the inside of a Blackberry 8800. A BlackberryForums user was bored, so he disassembled his Blackberry 8800, colored his trackball, and took some photos. This is not the first time we've seen someone taking apart their Blackberry, but it's always interesting to see the guts of your device.